FREE 8×12 U.S. Flag at Valu Home Centers! 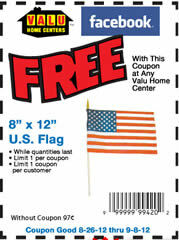 Bring this coupon to your local Valu Home Center to get a free 8x12 U.S. flag! Expires 9/8/12.